Well folks, training for my 3rd half marathon has begun! I’m training for the Maritime Race Weekend Tartan Twosome (double race). I’m running 5k on Friday Sept 11th (evening) and a half marathon Saturday Sept 12th. 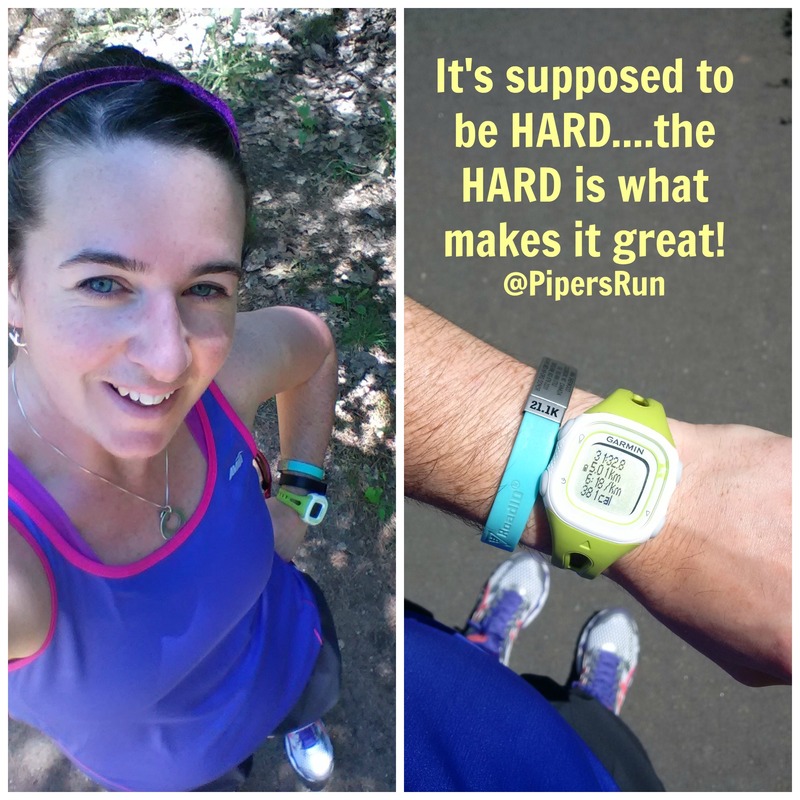 Past participation: I ran the Tartan Twosome last year – 5k Friday and 10k Saturday where I got two Personal Bests!! Review for 5k here and 10k here. I’m really excited for this race as it will probably be my first race of 2015. That’s what happens when you spend 6 months on the injured list! 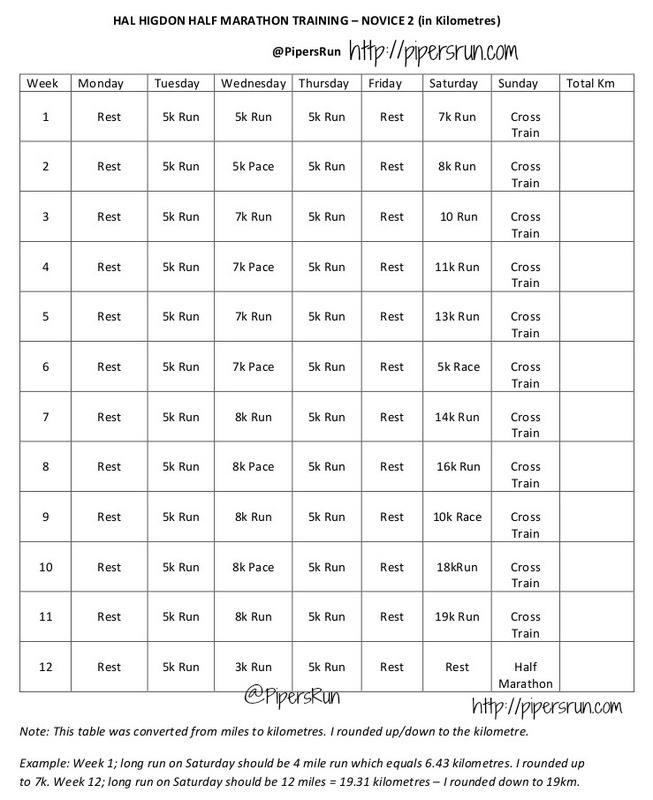 I am using the Hal Higdon Novice 2 Training Plan and have adapted it to kilometres. 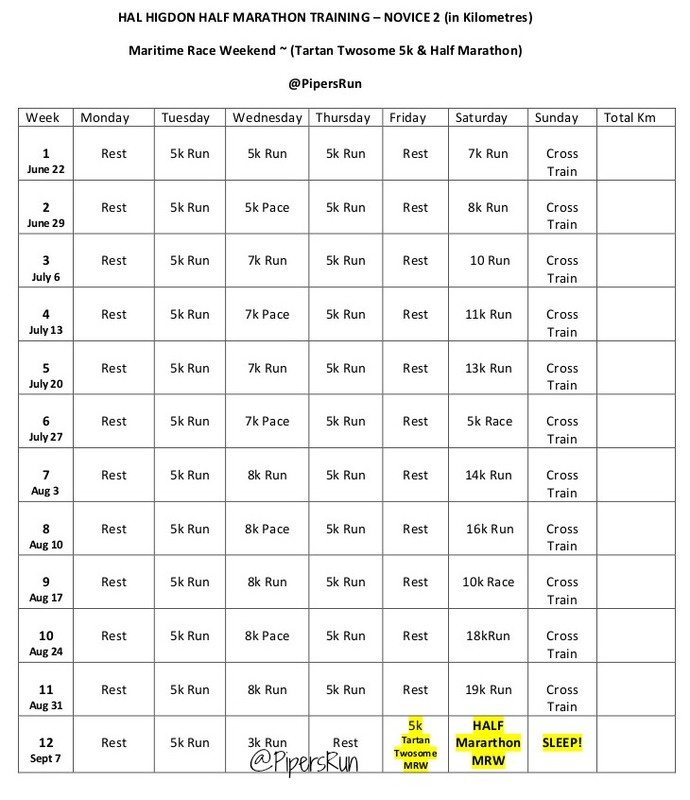 Last year, I used Hal Higdon’s Intermediate Training Plan and loved it! I wanted to use it again but felt that I’d be jumping into TOO much running for where I am at with my hamstring (which is really good at the moment!). I’m scaling it back a bit but that’s not to say I won’t adapt the weeks as I move along. I’m planning on doing some cross training: DVD workouts, cycling and swimming with the girls J Yes, I’m totally going to count swimming with the girls as part of my training, ha ha! Today’s plan was a 5k run! After two days of running 5k’s on my treadmill, my legs and body were a little tired. Not to mention I am still rocking the 30 day plank challenge each morning. I’m up to 2 minutes and 25 seconds – holy poop! It’s hard most days but today for some reason I got through it with very little struggles. Not sure what that means for tomorrow’s plank (2:30). Today’s run was nothing but a struggle! It was terrible! I started off with a few hills (bad idea) in the shade and ended with a flat trail in the direct sun. It was rough but I feel great now! Would you rather run hills first or flat trail during a training run? Would you rather run in the shade or sun your entire run? I use a modified version of Novice 2 as well! More so for the long run progression. I like a little sun, but too much sun/heat really drains me. I figured Novice 2 would be a smart way to go and running more then 4 days a week for me is really hard to manage all of a sudden! I modify it, and only run 3 times per week and doing yoga and strength training the other days! I would love to do one of the long runs together on the BLT trail if you are ever in town on a Saturday or Sunday morning. oh god, I enjoy a long, slow run. I’m happy to run with you at any pace. Shade please! So happy to hear you are training again! Can’t wait to see how it goes for you! I start training for half #6 next week!!! Can’t wait to follow your training!! What training plan do you use? Wow, 6th!!!! Congrats on beginning your next training program! I’ve always been curious about Hal Higdeon. People love his training plans! something to try in the future for sure! Thanks! It’s exciting for sure!!! I loved his Intermediate plan last year and would do it again but feel I need to take it a little easier this time around. Yes. I have one I can email you. Just on the road at the moment but will connect this weekend. Cool thank you & safe Travels! Awesome!! 😀 Good luck with the training and I’m sure you’ll do great. I know you must be so excited to have a race to look forward to! Thanks! It’s a little more laid back then what I’ve done before but my goal this time around is to just get strong and back to running / training for half marathon’s again. PB’s will come when they come 😉 It’s super awesome to have a race (or two) to look forward to! You definitely need to check out MRW – so much fun, great location and great people – lots of #RunATCan people! I’m unsure about the half marathon course – I kinda don’t want to know it, ha ha. But I have heard it’s hilly. I’ll have to ask around for opinions! I am thinking of doing Half #4 this fall. MRW was my second one. Guess I better start training. Good luck! Which one are you doing this fall? How hilly was MRW? I’ve heard it was but unsure what it compares to, or if it was hard/easier then Bluenose/ValleyHarvest/PEI etc. Thanks Sarah! I’m so excited I am back to training again and feeling a lot better these days! Feeling really good lately! I don’t mind sunlight but running up hill in the heat….need some shade at some point! Good luck! Hal is my homeboy when it comes to training plans. And I’m all about running in the shade – I hate the heat! You know, Hal has pretty awesome for training plans! I’m so happy that you get to start training for a race! I’m not training for anything specific right now, but I’ll start half marathon training in August.